Want to eat local pork, but can’t afford to pay for it all at once? Or, you can’t fit it all in your freezer? Problem solved! Sign up for our new monthly PORK plan or MEAT LOVERS plan, and get a nice portion of meat every month for a year! Thanksgiving turkeys. Our turkeys are free-range, and they’re some of the most entertaining animals on the farm. They follow you around, gobble (in unison) when you laugh, and have some pretty interesting expressions. Order them now, pick them up the day before turkey day. Meat chickens. Our Cornish X chickens are free range, which means they get to choose what they eat, and when they eat it. You can taste it in the meat. Pigs and USDA pork cuts. Yes, that means bacon, along with other delicious cuts. Or half or whole pigs — your choice. Our pigs are woodland/pasture-raised. Our pens are placed on rough natural terrain. We feed the pigs grain, grocery store waste food, spent grain from a local brewery, and whatever else they can find on the ground such as bugs and plants. Hormone and antibiotic-free. Order now! We are barter- and BitCoin-friendly! Posted in Bardo Farm Blog, Share with Bardo Project | Comments Off on Time to order! Bardo Farm Festival — one more week! A 4-day long outdoor farm and music festival. Our famous Bardo pig roast is included with admission! Posted in Bardo Farm Blog | Comments Off on Bardo Farm Festival — one more week! Posted in Bardo Farm Blog | Comments Off on Baby Animals!!! We hope you find it both educational and entertaining. Follow our Blog here on the site (and on Facebook and Twitter) to see what’s new at the farm. In the “Buy” section, find out what we have to offer, and even place an order. In the “Learn” section, discover all the animals and other farm projects we have here at Bardo. In “Particpate“, you can learn how to be a part of the Bardo family. Check out our “Wishlist” to see items which are needed to help with farming operations. 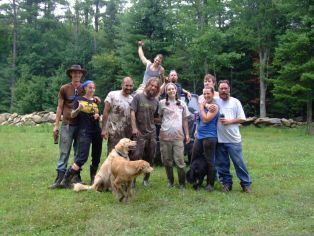 Read “About us“, to see what we do at Bardo Farm, and how we came to be. Also, check out our main site, “Bardo Project“. We are very proud of all we have to offer in 2013, and can’t wait to share with you. From all of us at Bardo Farm, thanks and enjoy! Posted in Bardo Farm Blog | Comments Off on WELCOME! We have already collected, boiled down, and bottled 8 gallons of Bardo syrup! We have Grade A medium so far. Sugaring should continue this week — the weather forecast looks good.